There’s more to the India-China deficit than iron ore.
India’s growing trade deficit with China has become a permanent fixture in all bilateral discussions held between the two countries. The gap has been increasing and, according to provisional data for 2014-15 presented to the Rajya Sabha, the gap is now over $48 billion. The Chinese scholar on the panel for this session—Zhao Zhongxiu, dean of the School of International Trade at the University of International Business and Economics, Beijing— provided a rationale for the large trade deficit. 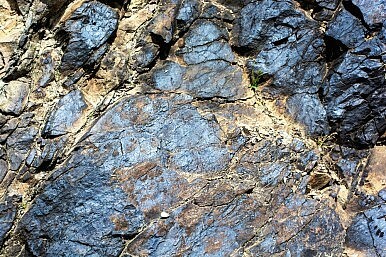 He said the deficit was due to India’s ban on exports of iron ore.
Zhao’s contention is valid to some extent—courts in India have been imposing varying levels of embargo—either area-specific or by occasionally capping output—on iron ore mining and exports since 2010, aimed at curbing illegal mining and clandestine exports. But Zhao’s explanation is only partially true—various other reasons have been adduced in the past for the growing trade deficit between the two countries. 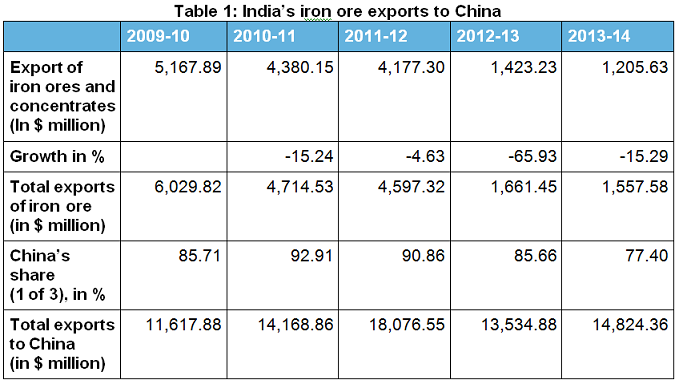 As Table 1 shows, India’s exports of iron ores and concentrates to China have been falling steadily, with the sharpest drop in 2012-13. This was the year that India’s overall iron ore exports also plummeted as a consequence of an expert panel shutting down all 93 mines in Goa after finding serious “irregularities and illegalities”. This came on top of a Supreme Court-mandated blanket ban on private sector iron ore mining in three Karnataka districts (Bellary, Tumkur, and Chitradurga) in the previous year, which was followed up by the Center imposing a 30 percent export tax. In 2014, the Supreme Court lifted the Goa mining ban partially by imposing an annual output cap of 20 million tonnes. The Center also reduced the export tax for low quality iron ore to 10% in April 2015. The impact of these decisions on exports will become evident over the next few months. However, Zhao’s contention seems a little laboured when viewed through the lens of overall India-China trade figures. The data doesn’t seem to validate his argument. As Table 2 shows, India’s exports to China suffered a severe setback in 2012-13 and dropped by $4,541.67 million. This is also the year that iron ore exports to China suffered a pronounced drop. On first look, therefore, the fall in overall exports can be attributed to a drop in iron ore exports. But that would be a mistake. That’s because the drop in ore exports to China is only $2,754.07 million—and this means that China did not buy $1,787.6 million of other goods that year. India’s exports have continued to languish thereafter, with the provisional data for 2014-15 showing a precipitous drop in export receipts from China: overall exports are unfortunately back to 2009-10 levels. However, there has not been a concomitant drop in China’s exports to India; in fact, it is quite the opposite, with provisional numbers showing a sharp recovery in China’s exports to India. So, if India’s exports have been falling each passing year, while China’s have grown apace, leading to an unsustainable trade deficit, surely it has to do more with reasons other than dwindling iron ore exports. It would have been only fair if Zhao had also mentioned India’s abiding contention: the tariff and non-tariff barriers (such as phytosanitary standards) that China imposes on Indian exports of pharmaceuticals, agri-products, or IT enabled services. Zhao should have also enlightened the Forum about India’s insistent demands for simplification and greater transparency in China’s procedures related to registration, inspection, and approvals of imports from India. Otherwise Zhao is presenting only half the picture. Rajrishi Singhal is Senior Geoeconomics Fellow, Gateway House. He has been a senior business journalist, and Executive Editor, The Economic Times, and served as Head, Policy and Research, at a private sector bank. This article was originally published at Gateway House: Indian Council on Global Relations, a foreign policy think tank in Mumbai, India, established to engage India’s leading corporations and individuals in debate and scholarship on India’s foreign policy and the nation’s role in global affairs.